Lots of people are scratching their heads trying to figure out how to earn money on Facebook. If you are a Facebook user and have been using the giant social networking site to keep up with friends and family, you've probably wondered if there is any way to cash in on Facebook. Now coming straight to the point, unless you have page with huge fans you cannot earn through FB, since FB pages are the only way you can connect with your users and then cash in on them. Getting likes is very difficult on FB pages unless you are advertising or have huge followers or use Blackhat methods which will ultimately get you banned soon. Now here I present you this eBook which will get you started with your FB page, or if you already have one then also its not a problem. 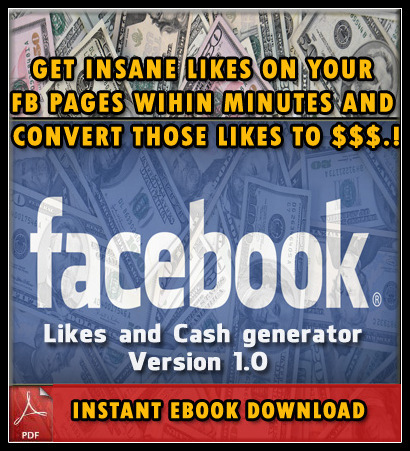 The eBook shows you how to exactly get insane likes on your pages and then how to cash in on them. You can get it running in just one day and start earning from the very next day.